Scientist Ben Twining described the methods and technologies he uses to conduct research about melting icebergs in the Antarctic, including CTDs, ROVs, LSTs and UAVs (you can find out about these and more by watching the presentation!). In his presentation he explains the physics that occur at the boundaries of melting icebergs and the implications for nutrients and particles as they are carried with freshwater into the surrounding denser sea waters. These nutrients in turn have implications for phytoplankton and zooplankton living there. 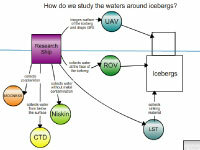 The research team's use of a small remotely operated airplane has allowed valuable overhead observations of iceberg structure and Ben's concept map includes access to a dramatic video of one of the plane's "voyages" to an iceberg. Annette deCharon, COSEE-OS director, talked about the components of concept maps and the challenges many people have when they begin constructing them. She shared the "Luke Skywalker" technique she uses to help people get comfortable with the mapping process and as a method for learning about each other and for team building. Attached to Annette's maps are a variety of useful and fun resources specifically designed as "warm-ups" for concept map skill-building: these include "Conceptionary" (a variation on Pictionary), which provides practice in thinking about complex concepts and ideas, and "At the Movies", an exercise for honing linking phrases. 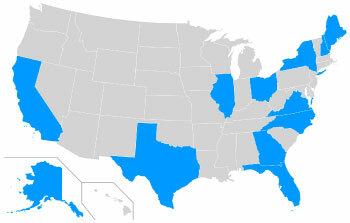 Thirty two participants joined from thirteen different states, including as far away as Alaska. Of the 13 participants who filled out the post webinar survey, 100% said that the scientist presentation was "useful" or "very useful", and 90% said they felt more comfortable with the topic than they had before. 50% also said they now feel the topic is more relevant to their own work.